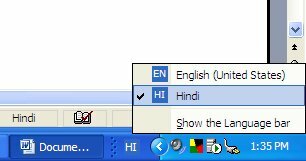 In the previous tutorial you have learnt how to enable Hindi, an Indian language, in Windows XP. In this article we will learn how to type in Hindi. The procedure is the same for all other Indian languages supported by Windows XP. Once Hindi keyboard (IME, Input Method Editor) has been installed by the above mentioned steps, user will see a small text-icon with EN (which means English) on it, to the left of the system tray. Open any application, say Word 2003. Click on this text-icon and user can see additional language (Hindi, in the current case). Click on HI Hindi to invoke the Hindi keyboard (IME). For those who want to know the key assignments, i.e., to know which physical key on the keyboard corresponds to which Hindi character, there is a utility called on-screen keyboard driver. To activate that follow these steps- Click on Start -> All Programs -> Accessories -> Accessibility -> On-Screen Keyboard. User can refer this keyboard for typing. User can also click this keyboard, but entering the text this way will be a slow process. Nevertheless, this keyboard can be used during the learning period.